Etosha National Park meaning the “Great White Place of Dry Water” is approximately 20,000 sq km with a vast white & greenish – like surrounding. In 1851 John Andersson and Francis Galton were the first Europeans to arrive by wagon in Namutoni, one of the parks inside Etosha. At that time Etosha didn’t attract the interest of tourists or conservationists until after the 20th century, when the German South-West African Governor Dr F von Lindequist became concerned over diminishing animal numbers. Over 114 mammal species, 340 bird species, 16 reptiles and amphibians as well as countless insects are protected by the Park. Today Etosha had been increasing in sq km up to 23,175. The most widespread vegetation is mopane woodlands, stretches of savanna dominated by the umbrella-thorn (Acacia torilis) and other trees. Visitors may observe elephants, giraffes, Burchells zebras, springboks, red hartebeests, blue wildebeest, gemsboks, elands, kudus, roans, ostriches, jackals, hyenas, lions and sometimes even leopards and cheetahs depending on the season. Among endangered species is the black rhino seen at Okaukeujo and the black-faced impala around Namutoni. Bird watching is spectacular especially when it is hot. During winter season the wildlife normally cluster around the water holes while in summer conditions animals disperse and look for shelter in the bush. Petrified Forest as the name says is a garden of scattered petrified tree trunks up to 34m long and 6 m around which are more or less older than 260 million years. This open area of veld lies 40km west of Khorixas. The trees got their origin from the ancient gymnospermae better known as the cone-bearing plants. Nowadays it contains more modern plants such as the conifers, cycads, and welwitschias. Please note that is strictly forbidden to carry off any scrap of petrified wood no matter the size. One of the most extensive galleried of rock art in Africa can been seen here. Twyfelfontein was named by the European settle D Levin because of its grassy valley surrounded by rocks. 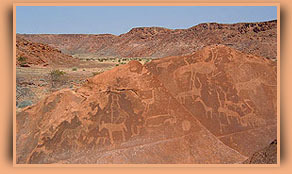 The petroglyphs are estimated to be around 6000 years old and covered the sandstone by cutting through the enormous patina. 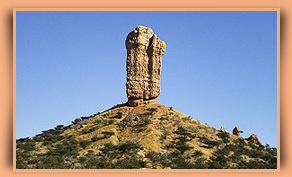 The unusual vingerklip got its name from its extreme popular features. It lies on the Bertram farm 30 kilometre's from Bambatsi. This towerlike pillar is about 35m high formed over 15 million years ago.